The Caddis fly Shop works with many clients and Professional Guides who depend on OUTCAST PRO Series inflatable boats throughout the season; we know these products first hand and can advise you on their capabilities and help you select accessories too. These OUTCAST PRO series inflatable boats feature the highest standards in the industry, they handle big water and put you and your clients on the fish in the least accessible places one can imagine . OUTCAST PAC 1200 This pontoon is 13 feet long, but it has 20 inch tubes and will allow you to fish with a friend or single guide client in some pretty gnarly whitewater rivers. We always advise caution, but this PRO series pontoon is a winner for the two angler team on many but the roughest of waters. OUTCAST PAC 1300 An amazingly stable, 13 foot long by 68 inch wide all around inflatable boat, with a full half ton load rating. The oarsperson in the center can fish clients standing in front and to the rear of the rower position. 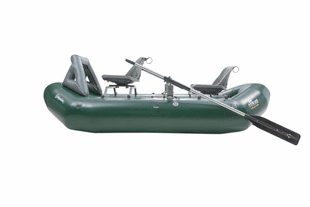 OUTCAST PAC 1400 This is the GRAND DADDY of the PRO series OUTCAST inflatable boats that is designed to fish two anglers with the oarsperson in the center. Swivel seats in all three positions and stability braces for the two angler positions. 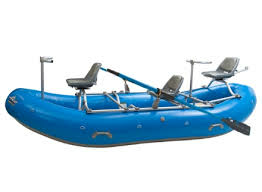 This boat is 14 ft long by 72 inch with 19.25 inch tubes; the load capacity of this boat is 1150 pounds.